My four year old has outgrown his 4T jeans and cooler weather clothing, and while the majority of them are going to find new homes at our church’s Mission Center, we decided to recycle of a few of them and make a new friend, a scarecrow! If you want to stand up your scarecrow, you will need to make a frame out of wood. If you are going to sit him on a bench or hay bale, you can skip this part. We purchased the wood at Home Depot for $.92. 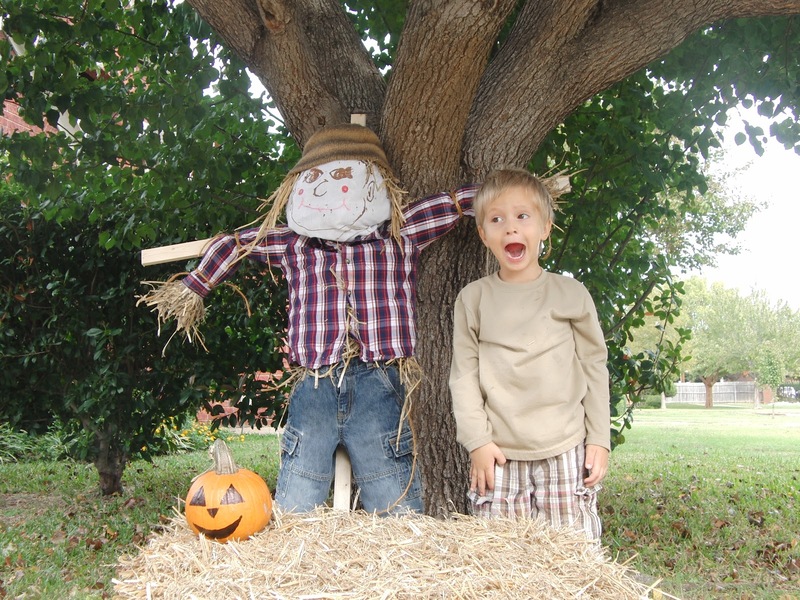 Because I wanted a preschooler sized scarecrow, I measured my little boy. He is 42 inches tall and he is 41 inches from finger tip to finger tip. 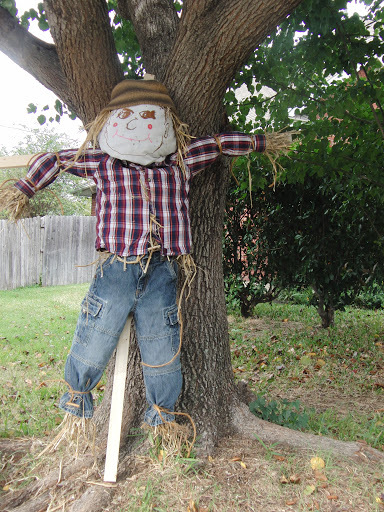 Since I am planning to “plant” the bottom 12″ of the frame, to make our scarecrow stand up, I need a stick that is 54″ tall and one 41″ to secure his arms. I used a screw to secure the 2 sticks together. Once we get home, and I get cleaned up, I gathered a pair of his favorite jeans and a button down shirt. We aren’t really trying to scare away any crows, and I want it to look more like a scarecrow than a little boy. I like the way the hay looks sticking out of the holes of a button down shirt! We purchased a bale of straw at our local feed store for $8. Ask for straw instead of hay, because it’s less expensive, and your scarecrow will never know the difference! Stuff the jeans and shirt. Again, I want some of the hay to show, so I overstuffed and pulled some down the arms and legs of the jeans. Then using twine, tie them off so it doesn’t fall out. Use tacks or a staple gun to secure the shirt and jeans to the frame. I also used safety pins to attach the shirt to the jeans. The head is the most complicated part of the scarecrow. The first jack-o-lanterns were made to adorn scarecrows. You can also use a pumpkin and paint a face on it. (it will last much longer than if you carve it). When I was a child, we had a scarecrow every year, and my mom would use a small, white pillowcase and paint a face onto it. It’s lighter and will stay in place much longer. I outlined the face, and since this is a project for my little one and he WANTED to paint, I let him fill in the eyes, etc. I probably could have done a better job, but the project is about him, and for him, not me. Every good scarecrow needs a hat! My little guy wasn’t about to share one of his baseball caps, but he was fine letting me use one of his brother’s knit hats. Be sure and stuff a little extra straw under the hat for hair!